What is a lead capture form and how does it work? A lead capture form is a form that asks a viewer to leave their email address before they can see your flipbook. It allows you to collect leads right within your publication. By adding a lead capture form, you can track who accesses your content and how they interact with it. This feature is available to all users with FlippingBook Online Optimal, Advanced and Team. How can I add a lead capture form to my publication? Can I collect the first and last names of my readers? Can I allow my readers to skip the lead capture form once it has been enabled? Can I add a lead capture form to a specific page? How can I make sure a viewer will see the lead capture form in their preferred language? How can I add a lead capture form to a publication? Click FlippingBook Online > Publications on the left-hand side of your account. Find the publication to which you want to add a lead capture form in the My publications list. Hover over thw publication and choose Customize. Click Lead Capture form, then click Enable. By default, a lead capture form only asks people to enter their email address. However, it is also possible to collect the first and last names of your readers. Go to your publication and choose the Customize. Click Ask for first and last name to enable it. Can I allow my readers to skip the lead capture form once it has been switched on? Go to your publication and choose Customize. Click Allow to skip to enable the option. You may want to add the lead capture form to a specific page in your document – for example, to give your reader a little preview of the content they will get before they decide to leave their email address. 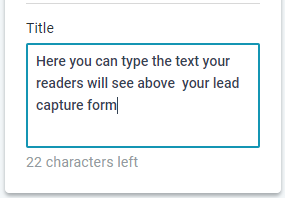 Go to Set on page and choose the page where you want your lead capture form to appear. The publication interface supports 17 languages: English, German, French, Italian, Dutch, Spanish, Portuguese, Swedish, Russian, Japanese, Simplified Chinese, Polish, Norwegian, Finnish, Turkish, Hebrew, and Arabic. The Lead capture form feature detects a viewer's language based on their web browser settings and auto-translates accordingly. So, if your publication is viewed, say, in Japan, the form will appear in Japanese by default. Should you want to see the form in a different language, just change the language settings in your browser.